The Rosé movement is well underway and particularly these last three to four years some of Washington's finest winemakers have jumped into the fray to reclaim the pink from the plonk. While pink wine is gaining serious ground it still faces an uphill battle thanks to all those California yahoos and their White Zinfandel. The sickly sweet pink plonk has long lingered on America's bottom shelves and it still haunts the memory of many a domestic wine drinker. Fact is the French have been crafting beautiful, complicated and food friendly Rosés forever but the Ford Pinto of pink wines like many evils, White Zin dies hard. Luckily, some of these recent iterations produced here in the Pacific Northwest are down right complex, loaded with interesting minerality and subdued and layered fruit flavors. As Spring rolls around eventually and we start to get some of that Northwest Summer weather that we came here for in the first place, the time is right. The deal is, if you want to appear to be among the wine cognescenti then the fact of the matter is, this time of year, you gotta drink pink. In addition to drinking pink, it's a good idea to know where it comes from and the traditional methods for producing Rosé. This is where you'll want to learn the term saignee which is French for "bleed." Red grapes are crushed, and a relatively small amount of the juice which has absorbed the pink hues from the skins is bled off to ferment separately. This is usually why you'll find the total production of your favorite winery's Rosé is in fact quite small. If wineries are setting out to produce larger amounts of Rosé they will use a skin contact method, which has the wine crushed and rather than being by-product in the production of a red wine, the wine is allowed to remain in contact with the skins for one to three days to produce a pink hue and then the skins are discarded and the pink wine or Rosé then goes into fermentation. 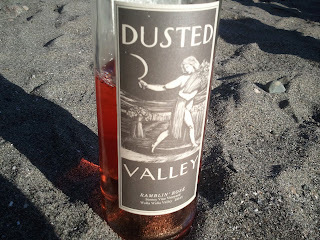 The 2011 iteration of the Ramblin Rosé harkens to a return to the Dusted Valley pink release of two years ago (a beauty). A paler pink color and light aromatics of rhubarb, apple blossom and early season cut strawberry lead you into a palate loaded with great minerality, subdued early season fruit character and brilliant acidity. We paired this rosé with cheese, charcuterie and a couple cold salads, this great dry rosé will stand up to a variety of hearty fare. The wine was a winner and won over a few Rosé cynics handily. Ramble on. this wine was provided as a sample from the winery. UnWine'd Rewind: Celebrate Oregon Wine Indeed!